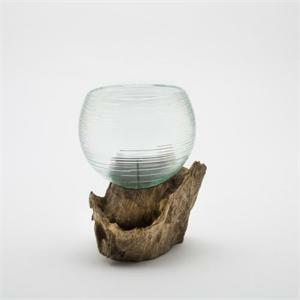 This finely crafted molten sculptural votive holder is made of hand-blown glass molded around teak root to create a truly unique and inspired artistic design. Perfect for flowers, floating candles, or perhaps even fish! Feel free to get as creative with this sculpture votive as you'd like. Please note, each molten votive decoration is one-of-a-kind and is not guaranteed to appear exactly as the picture depicts and may vary in size slightly.